Zadong, 5182m above sea level. We had reached the ‘summit’ of our stay in Sikkim. There were tears and exhilaration amongst our group, lots of photo shots and a short walk to enjoy the snow and scree. I just sat there on a large rock feeling dreadful – too many hairpin bends – I wasn’t a good traveler at the best of times! Glad to have my feet back on the ground and a short while to recover, I thought back to the first orchid I’d every bought – a sorrowful-looking plant rescued years ago in a garden centre sale. 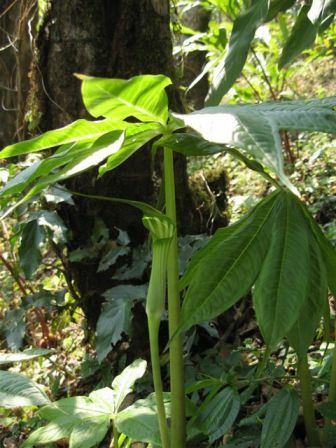 I was now hunting for orchids in Sikkim, an Indian State high up in the Himalayan Mountains. It was 3 April 2010 and we were being led by Simon Pugh-Jones of the Writhlington School Orchid Project and Lauren Gardiner, a botanist from Kew. There were eleven in our group, from all walks of life, some wishing to extend their knowledge of orchids and others just along to enjoy the scenery and do some photography. With great excitement we collected our baggage at Bagdogra Airport and met up with Mohan Pradhan (author, plantsman and leading conservationist) and Ganden Lachungpa (owner of Atlas Tours and Services, Sikkim) who organized, supervised and guided the whole of our stay in Sikkim. 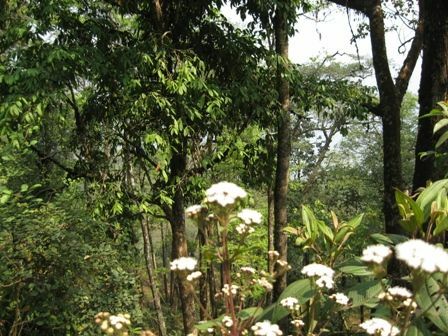 Several jeeps were loaded with our possessions, we clambered in and off we went in the direction of Darjeeling, West Bengal, where we were to spend out first night at Rhododendron Dell. A property and garden owned by the late politician, Madan Tamang. Mr Tamang was, reportedly, murdered a few months after our visit. This morning we had good reason to rise early from our beds, not only was it the first exciting day of our trip but we also hoped to see Mount Kanchenjunga from the terrace of our accommodation. There she was, surrounded by the glint of the sun, the third highest mountain in the world, standing at 8,603m – what a spectacular sight! Meghma at 3,048m was our first port of call today. Part way along our route we transferred to very old Land Rovers – modern vehicles, we were told, could not withstand the terrain ahead. The ‘road’ was cobbled and extremely bumpy. We found lots of Coelogyne and Cymbidium on our short stops and the cheerful red-flowering Rhododendron arboreum and Rhododendron barbatum were in flower. Lunch was served in one of the old buildings in Meghma. Lunch was always welcome, so too were the locally made Easter eggs given to us by our hosts – after all it was Easter Sunday! Before our departure, Mohan took us all below in the building to show us a little factory where Rhododendron petals were laid out to dry for wine making. Back at Rhododendron Dell by late afternoon we had enough time to enjoy a few hours shopping in Darjeeling. The bazaar there is a must, and, if you’re a tea addict, you’ll be spoilt for choice. A visit to a tea tasting house was on the agenda. I was all ‘tea’d’ out by the time we left but we did enjoy ourselves and purchased packets of tea to take back home. Back at our lodge we were all surprised at how cold the evening had become – oh, how we wished for a hot water bottle to take to bed! Next morning was an early start, earlier still if you wished to enjoy a walk in the garden at Rhododendron Dell with Mohan as your guide. What a delightful garden, no doubt having been Mr Tamang’s labour of love for many years. Orchids, especially Calanthe, Cardiocrinum, Rhododendrons and Azaleas, to name but a few, all growing on steep terrain. Our stay was short, we said our goodbyes and were, once again, on the road. I use the word ‘road’ loosely here. Never have I closed my eyes so much and resorted to prayer!! I just thanked myself lucky that we had come before the monsoons. The roads, some no more than wide muddy tracks, were carved along the steep mountain sides. No roadside barriers offered security between us and the frightening, rocky, steep slopes dropping down to the valley floor or river below. It was evident that the monsoon periods caused massive landslides. Thank goodness for the invention of the jeep and the skill of our drivers! We stopped for a wonderful view of the confluence of the Rangit Chu and Teesta Chu (rivers) and a few short walks to enjoy Dendrobium densiflorum, Dendrobium fimbriata, and many more. 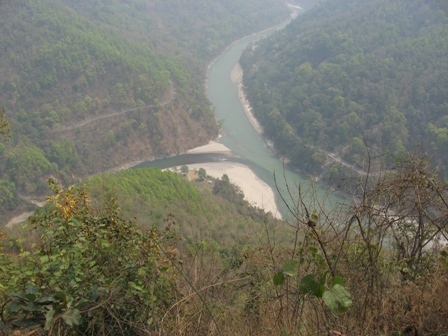 We drove high up along the Teesta River. It saddened me to see the mighty hydro-electric dams being built along the route of this beautiful river, consuming land, habitat and ecosytems. The dams are to be the exporters of power to India’s electric power grid. Kalimpong, was another area we enjoyed seeing many orchids in the trees, in particular Dendrobium nobile, the national flower of Sikkim. Late afternoon we reached Mount Narsing Resort for our evening meal and accommodation. Our first word of warning – spiders! Check your rooms, under your beds, in your beds! I caught several in a glass jar and, unceremoniously, threw them out into the rain. The search for spiders, unpacking our bags and showering was somewhat hampered by one of Sikkim’s infamous power cuts. This wasn’t the first one we experienced and it wasn’t our last. The keen ones amongst us rose at the crack of dawn the next morning to take photos and, hopefully, see Mount Narsing. Like the evening before, the distant hills were shrouded in mist, so no sign of the mountain. The next day proved to be very warm and sunny and, with Mohan as our knowledgeable guide, we were shown around the Tinkitam Reserve, a protected area where the Paphiopedilum fairreanum grows high up on steep slopes – far out of reach! We saw Coelogyne cristata, Coelogyne nitida, Cymbidium Devonianum, Cardamom and Arisaema growing in the woodland and the most beautiful, swallow-tailed butterflies I have ever seen flitted past us along our way. Next we paid a visit to Borong where we were made very welcome for lunch at the Club 8000. Our energy replenished we enjoyed an interesting hour or two at a handmade paper factory and purchased some of their lovely gifts to take back home. Leaning out of the jeep window as we sped along, again, I managed to take a few photos of Damtang, Rabongla, a huge construction complex where there was soon to be built a monastery and a 46m Buddha. I could not help but wonder where all the money was coming from to fund these enormous projects. Everywhere we drove men and women were busy improving the roads, tarring, making chipping blocks for reinforcements, drilling out rock faces. Many of the road workers were Nepalese, or Indians who had come up from more southerly areas of India. Everyone was so friendly and I must comment here on the children walking along the road, to and from school. I have never seen such smart school children, beautifully turned out in their uniforms, some little tots not much bigger than the rucksacks they carried. Today our destination was Lachung. It was on this day that one of my ambitions in life were fulfilled – to see a tea plantation! The Temi Tea Plantation is the pride of Sikkim. It was established in 1969 and lies on gentle slopes covering an area of approximately 500 acres. It is Sikkim’s only tea plantation and the tea it produces is said to be one of the best in India. Mohan told us that it was his uncle who, back in the early 1960s, had five plants brought up from Darjeeling to start the tea plantation. I believe the plant grown is Cameliasinensis. We also managed to have a quick peep into the factory through the windows! It was a long journey, stopping at Mangan for a packed lunch – no matter where we were, we never went hungry. The drivers always produced plenty of food and lots of tea from huge vacuum flasks. In addition to these lunchtime stops, every morning we were each handed little bags containing crisps, chocolate, cartons of fruit juice, etc. The roads certainly deteriorated on this journey – if that was possible. However, I have to say that the State of Sikkim deserves credit when it comes to road building. A tremendous amount of work is always evident, especially so on this road, improvement to which was a priority in order to give easy and fast access to troops going to and from the Sikkim/Tibetan border. Hope our driver knows what he’s doing! Again, during the course of the day, we had views down to the building of the Teesta hydro electric dams. The countryside had changed now, from the warm, mixed tropical rain forest that we had driven through in the south, to more open hills. Evidence of farming and crop growing could be seen. The crops grown north of Gangtok are mainly hill rice, barley and cabbage. As we drew closer to Lachung the hillsides became much steeper and mountains could be seen in the distance. I need to mention that we had passed through several military police check points on our journeys so far. Our passports were frequently checked and so too were our restricted area passes. Ganden always seemed to be busy making sure our travel went smoothly. Sometimes he would leave us for hours, once a whole day, taking our passports with him. I could only assume that he was having our documents checked and cleared so that passage through our next military police checks went smoothly. We traveled on, the last lap of our journey before nightfall. The hillsides covered with the splendor of many flowering shrubs. At this altitude their flowering season had barely started but we did see lots of Rhododendron arboreum and Pieris formosa bushes in flower. Season House, our accommodation for the next few nights, was a wonderful lodge-type property enjoying a very lofty position in the hills high above Lachung, a Bhutia village at an altitude of around 2,438m. The property was owned by Ganden’s nephew, Tashi Lachungpa, and Tashi’s mother. Before our evening meal we sat outside on the terrace in front of the house – what a spectacular location to enjoy the mountains – but cold! It was far colder than we had been accustomed to, so far, but our evening meal was delicious and, being the birthday of one of the ladies in our group, we all enjoyed a huge birthday cake presented to her by our hosts. It was always early to bed, early to rise. Some of us had been dressed and enjoying a cup of tea on the terrace at 5.30am the next morning – always keen to see the mountains before they disappeared, yet again, into the mist. I might add that someone had risen well before us that morning as, on the terrace, another huge vacuum flask full of tea had appeared – with biscuits! Our keen photographer had been the first out of bed that morning and, whilst we enjoyed our early morning cuppa, he could be spotted on the nearby hills following some bird or butterfly. I have to say the breakfasts were worth leisurely enjoying – sitting there on the terrace, soaking up the early morning sun and the surrounding mountains. Porridge (with full cream milk), omelettes, fresh bread, in fact everything you could wish for to put you right for the many hours of travel ahead. I ventured out that morning with my camera and came across a few yaks which had just been driven up to the sparse pastures by a child. I made an attempt to photograph them but they certainly didn’t like my close proximity. I think I came back with lots of shots of cabbages! Today we traveled towards the border with Tibet, through a restricted military zone. The Yumthang Valley, at around 3564m, has incredible landscape with alpine meadows, Rhododendron, fir tree forests and, high above, the snow-capped peaks of the Himalaya. Whilst walking around the Shingba Rhododendron Sanctuary I saw the most beautiful rhododendron I had every seen, Rhododendron niveum – indigenous to Sikkim and the State’s national tree. Unfortunately, at this altitude, it was a little too early in the year to see many flowering plants but we did come across large areas of Primula denticulate and Potentillapenduncularis. That day we also saw Rhododendron campylocarpum, R. wightii, R. thomsonii, R. ciliatum, R. Sikkimensis, Daphne bouleau, Denticulate reptans, Pleione hookeriana and far too many others to mention here. Further north the landscape became very sparse and the bushes noticeably smaller. Yume Samdong was almost devoid of vegetation, the landscape being predominantly rock and snow fields. At Zadong the road suddenly came to an abrupt end – for us. Military vehicles passed by on their way up to the boarder. With relief I climbed out of the jeep – I had not traveled well today! Reluctantly, about an hour later, I climbed back into the jeep to ‘enjoy’ the hairpin bends again. Soon we were stopping by the roadside for a hot packed lunch and tea – again transported by our drivers. Just the smell of the food was too much for my delicate state – I wandered off down the road for some fresh air and to enjoy, once again, the Rhododendrons. Yumthang Hot Springs was our next stop. The water of this spring contains sulphur which is believed to have miraculous healing powers and can cure skin diseases. A small hut houses the pool where the sulphur water is collected for taking a pleasant, warm bath. I had it on good authority that it was thoroughly relaxing! A quick chance to take those last minute photos the next morning and we were loaded up and on our way south to Gangtok. One part of the route, around Chungthang, got rather chaotic. We came to a standstill surrounded by driven cattle, steam rollers and troops. With an overhanging rock outcrop above us and to one side and a sheer drop to the other. No problem! Never a bad word was uttered, everyone took the situation in their stride. We had a quick stop at another impressive waterfall, Beem Nala, surrounded by lush green forests and high-peaked mountains – a very popular tourist attraction and quite a spectacular sight. It must be awesome during the monsoon season. Another equally wonderful sight was a wooded hillside covered with white-flowering Brugmansia. There were lots of roadside stops on the way back south to see orchids, Cymbidium and Coelogyne were always in abundance but the one I admired the most was attached to a small tree at the end of a bridge – it was Chiloschista usnoides. 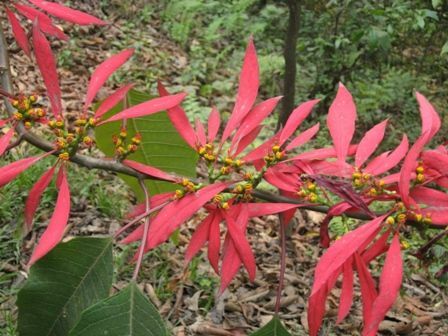 We also saw a cream-coloured Poinsettia, a change from the usual red-flowering ones so plentiful along the roadside. We arrived at Hidden Forest early evening. What a delightful place and everywhere in the garden and around the house there were orchids!!! We were all very hungry and tired after our journey. After a very enjoyable meal it was early to bed. Today Mohan and Ganden showed us around Lingdum Monastery. Lingdum is a fairly new complex of buildings which were started in 1992. The main building is embellished with the symbols of Tibetan Buddhist architecture and its courtyard is vast. There were also such beautiful paintings on the exterior walls. What a spectacular work of art and culture. Mohan also showed us around Andheri Khola valley, an area he hoped to turn into a reserve, being particularly valued for its richness in orchids. After the garden we were treated to a typical Sikkimese meal and Chhang at the Saramsa Resort Hotel. A beautiful hotel with its mixture of Lepcha, Bhutia, Nepali and Colonial architecture. Chhang is a preparation made from fermented millet served in bamboo containers with a hollow bamboo pipe used as a straw. It’s the ‘unofficial’ national drink! Rather too bitter for me, I’m afraid. The meal was served, course upon course, most of which had a rather spicy but very tasty. In the evening we enjoyed several hours in Gangtok to have a look around the shops. Nothing very much of interest to buy, I thought. One shop sold local crafts, about the only ones I saw on our whole trip. There was a craft centre in the area but, unfortunately, it was closed on the day we were there. However, we did experience a typical, evening downpour in the town. Did it rain! It absolutely threw it down for about an hour. Umbrellas were being sold by the dozen and so cheap. Some of us bought Sikkimese prayer flags to take home. They were also very cheap. 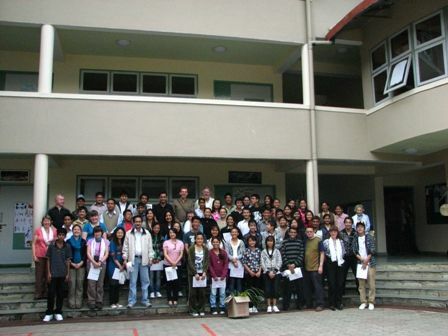 A day of workshops at Taktse International School turned out to be a terrific day. It was Sunday and sixty teenage pupils, ten representing each of six schools had given up their day off to come and meet us. We played ball games out in the sun in their huge courtyard, I guess the games were their equivalent of ‘ice breakers’. We then assembled inside for the workshops. Each of the members of our trip took it in turn to stand up and give a brief talk about ourselves and what we had enjoyed most during our trip to Sikkim. We then spent the rest of morning having short workshops sharing our experiences and identifying orchids. In the afternoon we had hoped the weather would be suitable for us all to have a helicopter ride. Unfortunately, the weather closed in quickly, so a short flight was offered to those who had never experienced a trip in a helicopter. Our last evening was a very memorable experience. Mohan had invited us to his house to meet his family, enjoy a wonderful meal and have a tour around his orchid houses. The vast selection of orchids Mohan grew was unbelievable, from thousands of seedlings to mature flowering plants and also Cymbidium which he grew for commercial purposes. A great evening was had by all and it was a great pleasure to meet members of Mohan’s family and Ganden’s wife, Usha. In addition to the evening meal, another huge cake was presented to a couple in our group who were celebrating their 25th wedding anniversary – such hospitality. We left Hidden Forest the next morning, our bags packed and loaded up by 6.35am. It was a long journey by road to Bagdogra Airport – I was certainly not looking forward to it. Fortunately, traveling via Siliguri, the main commercial city in North Bengal, the road was remarkably straight, albeit somewhat congested in places with all modes of transport and people going too and fro from never-ending shops which lined the roadsides. Our three flights home left on time and the whole journey was far less arduous than I had anticipated – thanks mostly to Jet Airways who took care of us on our long flight from Mumbai to Heathrow. Although being woken up around 3am to the smell of a spicy meal wasn’t too much appreciated! We were so lucky to get home, as planned, as 24 hours later the volcano in Iceland erupted. And, so we came to the end of our stay in Sikkim, a land with some of the friendliest people I have ever met. A land rich in treasurers that we must never lose. We couldn’t thank enough all those who had worked so hard, so efficiently, to make our trip a very memorable one. Many of us have said we would like to return – perhaps one day we will. If I lead, follow me. If I retreat kill me. Drink and drive and you won’t survive. Listen, the trees are whispering peace and love. Life is short, don’t shorten it. Save trees to save the environment. Wonder if you ever thought of those who defied death to make these roads. Keep left, it’s the right way to drive. Sikkim is a land-locked Indian state nestling in the Himalaya. It is formed on a huge dome of metamorphic rock stretching from Nepal to Bhutan. It is 100 kilometers from north to south and 80 kilometers wide. It has tropical rainforest, temperate forest to 3500, which is the upper limit of the tree zone, and alpine. 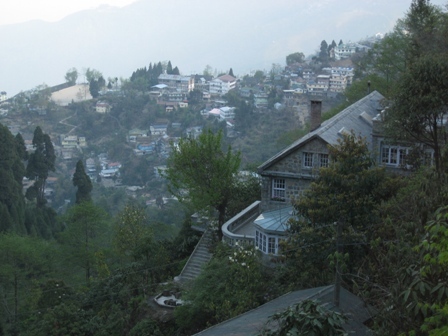 Gangtok is the capital. It is very hilly at 1870m and has in excess of 5000mm of rainfall each year, which mostly falls between May to September in the monsoon period. A new airport at Pakyong which is about 30 km from Gangtok is scheduled to be completed by the first half of 2010. It is also possible to fly by helicopter from Bagdogra Airport up to Gangtok. However, for groups with lots of luggage this would not be an option. The state has a booming economy dependant on agriculture and tourism.